The FRANK P. SAMFORD, JR. 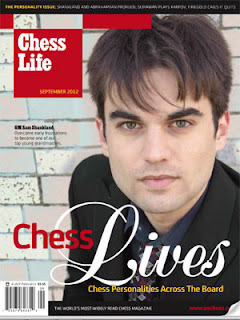 CHESS FELLOWSHIP, marking its twenty-seventh annual award, has selected Grandmaster Sam Shankland of Orinda, California, as its 2013 Fellow. The Samford is the richest and most important chess fellowship in the United States. It identifies and assists the best young American chess masters by providing top-level coaching, strong competition and access to study materials. The Fellowship also supplies a monthly stipend for living expenses so that the winners may devote themselves to chess without having financial worries. The total value of the Fellowship has been increased several times over the years and is now $42,000 annually. The prize is awarded for one year and can be renewed for a second year. The winners’ term begins July 1st, 2013. IM John Donaldson, in his report at the USCF website, further writes: All in all, it gives these brilliant young American Grandmasters the support and resources necessary to enhance their skills and reach their full potential. Currently rated 2612 by FIDE, Sam Shankland was awarded the GM title at the age of 20. His career highlights include tying for first in the under 18 category in the 2008 World Youth Championships, taking third in the 2011 US Championship, beating Hungarian Super GM Peter Leko in the 2011 World Cup and winning both team and individual gold while playing for the US team in the 2013 Pan American Team Championship. Since its inception the Fellowship has proven very successful. Many Samford Fellows have become strong Grandmasters, members of the United States Olympiad team and US Champions. America’s two top players, Hikaru Nakamura and Gata Kamsky, are not only rated in the top 17 in the world but are former Samford Fellows. Generous contributions from the late Mrs. Virginia Samford and the Torchmark Corporation support the Fellowship. The Samford Fellowship is a fitting memorial to an extraordinary man. The dedication, creativity and achievement that marked Mr. Frank P. Samford, Jr.'s life are examples for all chessplayers to admire and emulate. Endgame-Illusion Chess Puzzle: How can White Win?